Every year we are bombarded with magazine articles, television segments and blog posts about how to consume Thanksgiving leftovers in the days following Thanksgiving. I love those recipes! Look forward to them every year! This is not one of those recipes. This is a recipe of what to do with Thanksgiving leftovers on Thanksgiving Day itself! Too full? Can't imagine it? How many times have you read about the wonders of homemade stock? Have you ever made it? I do and regularly. I save chicken carcasses and put them in ziplocs in the freezer and I also do the same with my veggie scraps. Until this year, it never occurred to me to use my turkey carcass. And even if you've never saved a veggie scrap in your life, on the days leading up to Thanksgiving the perfect ones are in abundance. 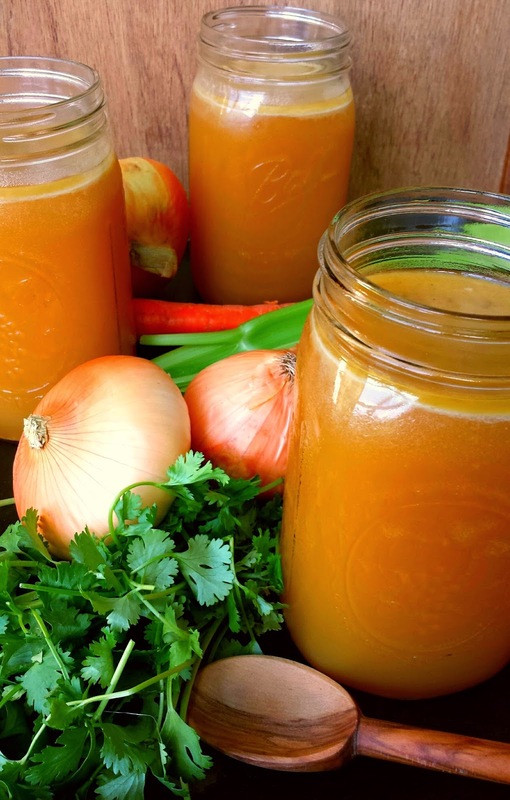 Celery, carrots, parsley, and onions are just what you need for good stock. Even though I normally save my carcasses and scraps and freeze them, why wait? Why bag? Why not just put my turkey carcass directly in my Hamilton BeachSet & Forget® 6 Qt. Programmable Slow Cooker and let the stock cook overnight? The carcass is just sitting there on Thanksgiving! My friend, Matt Baird, says the best stock comes from bones that have never been frozen, so there ya go! Wisdom right from the mouth of my favorite butcher. Place all ingredients, besides the water, in the slow cooker. Add as much water as you can. Set the slow cooker on low. Sleep off the L-tryptophan! You can cook the stock for as little as 10 hours and I've cooked it as long as nearly 24, so cook it for as long as fits in your schedule and until it is a rich, golden color and tastes delicious. Cool the broth down in an ice bath in your kitchen sink (another tip from Matt the Butcher) and then strain the solids and freeze in ziplocs with 2 cups of stock per bag. Lay the bags flat in the freezer to maximize space. Remember to label the bags with the date. If you want to make fat-free broth, after straining away the solids, put the broth in the refrigerator to cool completely. The fat becomes a solid layer on the top. Simply break it up and discard it. P.S. Are you going away for Thanksgiving dinner this year? You might check in advance with your host, but I know if I had a guest who offered to set up my slow cooker for overnight stock, I'd invite that guest back every year!